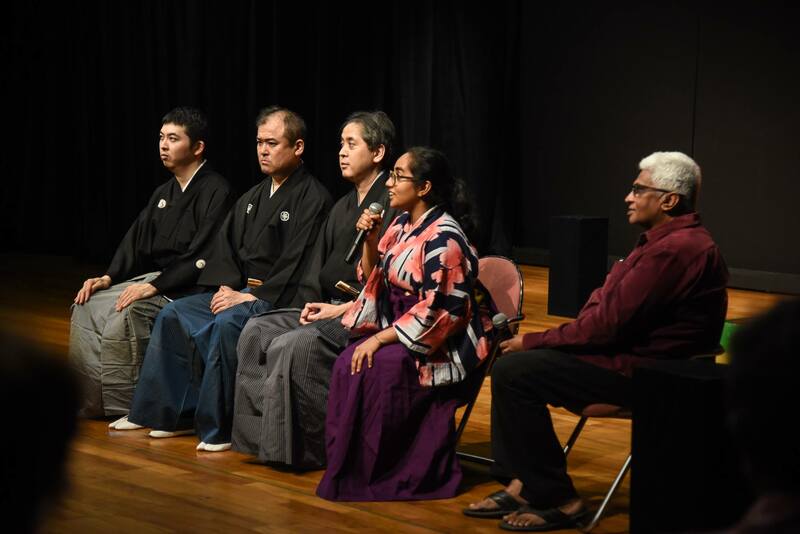 Some weeks have passed since my interpretation stint with the Intercultural Theatre Institute, and the 8 weeks of translating for the Noh masters, Yoshimasa Kanze Sensei and Takashi Kuwata Sensei remain imprinted in my mind. When the opportunity first presented itself to me, my mind went blank. It has been nothing short of a dream for me to interpret for Noh. From the first time I watched this art form at the National Library Drama Centre in 2010, I’ve been entranced with it. I cannot express in words, how a well-executed Suriashi (gliding steps) alone can bring tears to my eyes. So, during the first lesson, when sensei explained the Suriashi to everyone and I had to translate the very fundamentals of Noh to the students, I felt very emotional. Learning Japanese for 6 years, had not been for nothing. The entire 8 week process was exactly like this. I’d studied about Noh in university and in theory. I’d even watched several Noh performances over the years. But finally watching it being taught, and having to translate this teaching process, was a whole new world for me. In theory, I understood about the Jo ha kyu. In theory, I understood about the gestures and forms used in Noh to express emotions in a contained manner. But it is entirely different to hear from the master teachers themselves on how these theories are applied in performance, in Japanese, and to be able to translate them into English. It was mind blowing. Noh was foreign to all the students. None of them were Japanese. None of them speak Japanese, let alone ancient Japanese which is similar to Shakespeare English. The movements at a glance seem robotic, calculated and stiff with little to no explanation given at the very start. They were almost completely outsiders to the form. And of course, the masters are insiders to this traditional art. They’ve lived and breathed it for years. And yet, they are here in a foreign country with multi-national students in an intercultural institute. This was certainly a different environment from where they usually teach. And, even between the 2 teachers, there were differences in culture. Whereas Kuwata sensei had a more “contemporary” upbringing and chose to pursue Noh, Yoshi sensei came from a traditional Noh family and has been in that world since he was 2. The subtle differences were fascinating to observe even though they weren’t far apart in age. The teachers have also been visiting Singapore once every 2 years for the past 18 years or so, so they weren’t complete outsiders to Singapore and its multi-cultural society. In this scenario, I saw myself as a bridge. I was not exactly an outsider to the Japanese culture. I speak Japanese. I know some Noh. But I was not an insider, and I’m still learning and very much still an observer. My in-between status however allowed me to be a bridge between the worlds. There were certainly some challenges in being the bridge. Some students were not native speakers of English, I would internally sometimes flinch at the direct nature of some of the students’ questions and the teachers would sometimes give some harsh notes that translate pretty mildly into English, but carry a cutting tone in Japanese. As a rule, I did not (purposely) at any point leave out, censor or re-phrase what either party said to each other. I also tried my best to use standard English for most part. At some points however, when the teacher gave notes to individuals who were still in the process of learning English, I consciously used simpler English to convey the same message and spoke a little slower. If I didn’t understand what either party was saying, I tried to clarify it for myself before translating it to the other party and if I made a mistake in my translation at any point, I did my best to acknowledge it and rectify the mistake. So in translation, the message reaches me first before I convey it to the students. And I believe that translation is more than just translation of words from Japanese to English. It’s a translation of language, culture and tone. It was crucial that the students understood exactly what the masters meant to communicate beyond the language. As funny as those lines sound, and as much as we all laughed, those statements were 100% serious. I wanted the students to understand. The masks were older than the students and would cost thousands to repair. Despite the decreased visibility, spatial awareness is crucial. And although at the start, the masters didn’t give much explanation to why the movements had to be a certain way, as the actors memorized their lines, the teachers would give little tidbits of information. These notes struck such a deep chord in me. They seem like very simple notes, and they are, but it made sense of a lot of what I had thought to be “just technicalities”. To hear that the technical aspects had clear logical explanations to them, suddenly made Noh seem not so foreign (at least to me). Isn’t all theatre making like that, then? After I heard the explanations, I felt like I was peeking from behind the curtains into the deep deep world of Noh. Every time, it felt like another layer was peeled back to reveal something else. To conclude, I want to share with you my favorite Japanese word, Yūgen (幽玄). Yūgen suggests that which is beyond words. It is “a profound, mysterious sense of the beauty of the universe … and the sad beauty of human suffering” and is used to refer to Zeami’s interpretation of “refined elegance” found in Noh. The father of Noh, Zeami Motokiyo describes the above imageries as portals to Yūgen. My time at ITI could not be described better.